Purpose: Use this document as a reference for assigning a batch of students to a payment plan or third party contract in ctcLink. Prerequisite: This process requires an excel spreadsheet in .CSV format with student ID numbers. 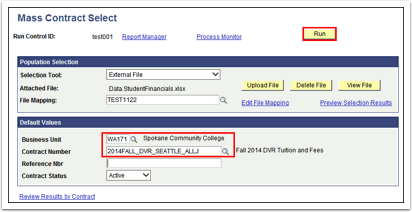 Search for an existing Run Control ID or select the Add a New Value tab to create one. Once a Run Control ID is saved for a given process it is available for future use. Select External File from the Selection Tool dropdown. Click the Upload File button and browse for the .csv document. Click Upload. Click the Create File Mapping link. Enter a name for the File Mapping and the EMPLID Field number. Click OK. Enter the Business Unit and Contract Number. Leave the Contract Status field set to Active. Ensure the Mass Contract Select checkbox is checked. Click the Process Monitor link and make sure the process runs to completion. Search for an existing Run Control ID or Add a New Value. 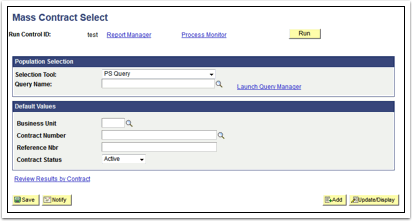 Select PS Query from the Selection Tool dropdown. Select the query to use (only queries valid for the specific process are available). Click the Run button. Ensure the Mass Contract Select checkbox is checked. Click OK.